Overwhelmed by all the possibilities of interoperability - plug and play apps, e-assessment, analytics? Are you looking for enhanced user experience and educational insight from interoperability. How do you get there from here? Waiting to get started is not the best strategy as every penny spent on non-interoperable approaches could be going toward establishing your integrated and insightful teaching and learning environment. IMS interoperability can start where your organization is right now in terms of your procurement schedule and priorities. 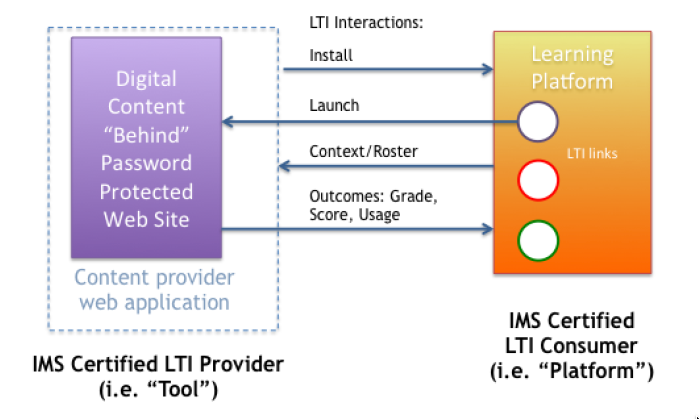 For many, this is connection of digital resources, tools and apps to an access point (like an LMS, portal or Learning Object Repository) using IMS LTI (Learning Tools Interoperability). For others it is e-assessment interoperability using IMS QTI (Question & Test Interoperability). For still others it is the rostering of students using IMS OneRoster or Learning Information Services. Your organization can start on the highest impact area and with one product at a time. No forklift upgrades to all systems or additional software is required. You can simply add IMS compatible pieces with each procurement by requiring IMS certified software. Contact IMS and we can advise you how to get an initial foundation in place. If you need more help, we offer a development assistance program. Whether you are an institution or a developer IMS provides “how to” documents, including procurement advice and language as well as developer resources, such as test harnesses and sample code/code libraries/APIs (application programming interfaces). IMS Global membership links your organization to the world's most advanced and extensive cross-platform EdTech implementation community where you can ask questions of IMS staff and other members within the IMS network (institutional and suppliers). Learn how to join IMS.